The word 'gel' came from the word 'gelatine' and was coined by 19th-century Scottish chemist Thomas Graham. Gel is a solid, jelly-like material and is mostly liquid, yet it behaves like solids due to a three-dimensional cross-linked network within the liquid. Gel has four types, one of which is a hydrogel which, according to Wikipedia, is a network of polymer chains that are hydrophilic, sometimes found as a colloidal gel in which water is the dispersion medium. 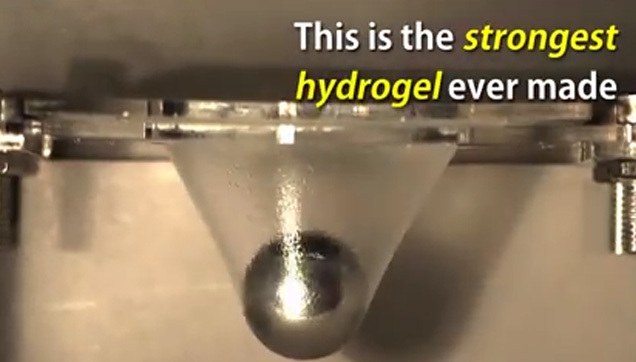 The alginate hydrogel is dubbed as the "strongest hydrogel ever made" and it is made of 90% water and two types of polymers: alginate (seaweed extract used to thicken food) and polyacrylamiyde (the main material in soft contact lenses). One study made by Silvia J. Bidarra, Cristina C. Barrias, and Pedro L. Granja said that "alginate hydrogels are extremely versatile and adaptable biomaterials, with great potential for use in biomedical applications." In fact, this kind of hydrogel can be used to replace cartilage, and injured tendons and ligaments. It is also used in breast implants, as a glue, and can be found in disposable diapers. These are just some of its many uses so watch the video and see for yourself what this amazing substance looks like and what else it is capable of!